The success of protein-based drugs has seen them impact on almost every branch of modern medicine. They are useful modulators of the immune system and this power has been applied in the clinic to devise new cancer therapies with stellar success. Sirukumab is an immune modulator that dampens inflammatory responses by binding the protein interleukin-6. This has already proved effective in treating rheumatoid arthritis, however, a more radical study is examining the usefulness of sirukumab in treating depression. This approach could open up a whole new field of drug development for further psychiatric conditions, including bipolar disorder, anxiety disorders, and schizophrenia, which may be driven, at least in part, by excess immune activity affecting the brain. Much of the work linking inflammatory processes to psychiatric illnesses stems from a startlingly obvious observation: everyone feels miserable when they are ill. Clinical and preclinical research over the last two decades has yielded a number of clues to support the notion that inflammation can indeed affect mood. For example, cytokines are a family of proteins that are key regulators of immune responses. Both cytokines and inflammation show major increases in patients during depressive episodes, and in people with bipolar disorder, cytokine levels drop off in periods of remission. Healthy people can also be temporarily put into a depressed, anxious state when given a vaccine that causes a spike in inflammation. Further clues are found in people with inflammatory diseases such as rheumatoid arthritis since they tend to suffer more than average with depression. Cancer patients given the cytokine interferon alpha to boost their inflammatory response and help fight the cancer, often become depressed as a side-effect. From all the biomarkers of inflammation whose expression has been associated with depressed mood, elevated IL-6 has been the most consistent. A number of research groups have also found that many neuro-receptors are affected by autoantibodies. These include the NMDA, AMPA and GABA receptors, in addition to autoantibodies targeting the potassium channel VGKC, all of which have important functions in the brain. Currently, there are over twenty neuro-receptors thought to be affected by autoantibodies whose identification can guide both diagnosis and treatment. Autoimmune brain disorders often respond dramatically to immunosuppressive therapy. There is a dearth of new treatments for psychosis -there have been no major breakthroughs in the last fifty years, and big pharma has largely neglected the area. It is the same for depression which sees 350 million people suffering worldwide, with an estimated 30 to 60% of these patients not responding to any current pharmacological treatment. In contrast, therapies targeting the immune system have seen heavy investment with a healthy pipeline of drugs already achieving market approval, or in late stage clinical trials. Sirukumab Mechanism of Action. IL-6 (pictured in red) is derived from immune cells such as macrophages and has a range of cellular effects, for example on T and B cell differentiation. These increase antibody production and differentiation to cytotoxic T cells respectively, and broadly promote immune responses. Sirukumab (shown in dark blue) binds and neutralises IL-6 protein in vivo, blocking its biological effect, dampening immune responses and inflammation. Establishing a link between the immune system and psychiatric disorders, therefore, offers the opportunity to borrow from this success, avoiding heavy drug discovery costs. 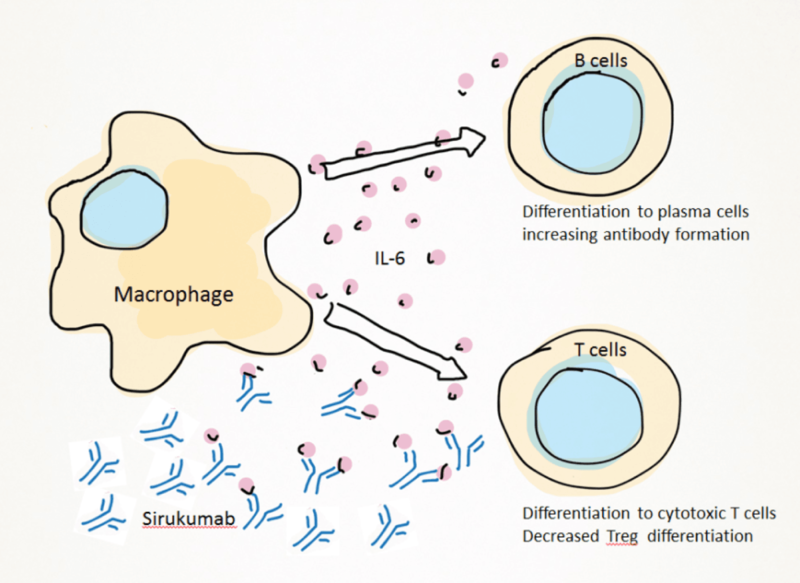 An example is sirukumab, a monoclonal antibody that binds and neutralises the cytokine IL-6. This cytokine has many functions within the immune system depending on which cell type it is acting upon (see figure above). Sirukumab was originally intended for the treatment of the autoimmune condition rheumatoid arthritis where it has proved a safe and effective medicine. A clinical trial is now underway to assess whether sirukumab is useful as an adjunctive therapy for patients with major depressive disorders. If successful this study will drive further research into the interface between the immune system and psychiatry that should encourage and inform more sophisticated interventions. It is tempting to think that the cohort of patients with depression who do not respond to current therapies are the same patients who show excess activation of the immune system. It is unlikely, however, that anti-inflammatories will become the doctor’s first approach to treating depression. Many questions remain to be answered: Which are the biomarkers of inflammation that could guide effective treatments? Why don’t all patients with autoimmune conditions become depressed? What are the triggers of depression following inflammation? Questions such as these will need to be answered before we can fully exploit the findings in this nascent field. If successful the sirukumab clinical trial will demonstrate a link between the immune system and mood in patients with major depressive disorders, driving further research. Confirmation that a subset of what we currently diagnose as primary psychiatric disorders, result from amenable immune conditions would open a route to new treatments from the immune modulators that are already available. In addition, the recognition that psychiatric conditions can result from imbalances throughout the body, rather than just the mind, may serve to dispel some of the stigma surrounding these conditions, and that alone would be welcomed by patients.